The centerpiece of the Ocean's Edge Wing, is a 28-foot-high (8.5 m), 333,000-US-gallon (1,260,000 l; 277,000 imp gal) exhibit for viewing California coastal marine life. In this exhibit, the aquarium was the first in the world to grow live California Giant Kelp. 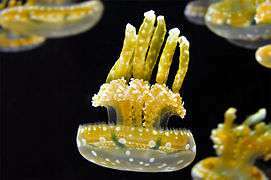 Visitors are able to inspect the creatures of the kelp forest at several levels in the building. The largest exhibit in the aquarium is a 1,200,000-U.S.-gallon (4,500,000 l; 1,000,000 imp gal) the Open Sea exhibit (formerly the Outer Bay), which features one of the world's largest single-paned windows. It is one of the few aquariums to successfully care for the ocean sunfish in human care. Sea life on exhibit includes stingrays, jellyfish, sea otters, sea horses, and numerous other native marine species, which can be viewed above and below the waterline. The Monterey Bay Aquarium is one of very few in the world to exhibit both bluefin and yellowfin tuna. For displaying jellyfish, it uses a Kreisel tank, which creates a circular flow to support and suspend the jellies. The aquarium does not house mammals other than sea otters that were rescued through its Sea Otter Program. There had been a number of attempts to build an aquarium in the Monterey area dating back almost 100 years. In 1914 an aquarium was proposed to the city council by Frank Booth with a cost of $10,000. 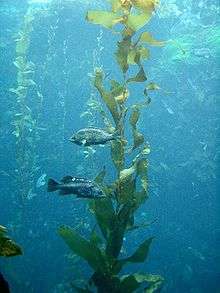 A bond issue was sponsored in an attempt to place an aquarium in the basement of the Pacific Grove Museum by Knut Hovden in 1925 and in 1944 an aquarium is suggested for Point Lobos State Reserve. 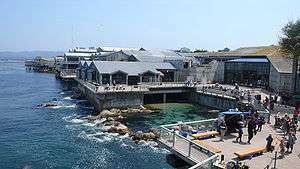 The aquarium occupies land at the end of Cannery Row (once Ocean View Avenue) in Monterey, at the site of the Hovden Cannery, a sardine cannery that helped to define the character of Monterey from the time it was built in 1916 to the day when it was the last cannery on the Row to close in 1973, after sardine fishing collapsed. 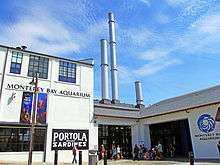 This building was dismantled in 1980, but beginning in 2002 the Monterey Bay Aquarium has blown the original Hovden Cannery steam whistle at noon each day to commemorate it. The Pacific Biological Laboratories of Ed Ricketts, on Cannery Row, Monterey, California. The aquarium's original building was designed by the architectural firm Esherick Homsey Dodge & Davis and opened on 20 October 1984. The aquarium's mission is "to inspire conservation of the oceans." The aquarium's initial financial backing was provided by David Packard, co-founder of Hewlett-Packard. Packard, an avid blacksmith, personally designed and created several exhibit elements for the aquarium at his forge in Big Sur, including the wave machines in the Kelp Forest and aviary. His daughter, marine biologist Julie Packard, is currently Executive Director of the aquarium. The aquarium was built in honor of the work of Edward Ricketts (1897–1948), a marine biologist who specialized in describing communities of organisms (which would also be the focus of aquarium tanks), and whose old laboratory (Pacific Biological Laboratories) (PCL) and home resides next to the present MBA site. Ricketts, whose life was an inspiration for the eventual building of the aquarium, is famous as the "Doc" of John Steinbeck's Cannery Row and Sweet Thursday. The aquarium itself contains a display of Ricketts' items, including some of his personal library. The shop also sells a variety of Steinbeck books. The basic design of the aquarium pumps 7,570 litres (2,000 US gal) of seawater from the Monterey Bay per minute, day and night, through the more than 100 exhibit tanks. During the day the water is filtered for viewing clarity. During the night, raw (unfiltered) seawater is pumped through exhibits, bringing in food in the form of plankton. Waste ocean water from the aquarium is returned to the bay. This design makes the aquarium essentially part of the ocean ecologically, and allows the culture of organisms such as giant Kelp which are not suitable for ordinary saltwater aquariums. The acrylic plastic (the same plastic as Plexiglas and Lucite) that makes the various tank walls ranges from 7.6 to 33 centimetres (3.0 to 13.0 in) inches in thickness, enabling them to resist the pressure and high total force of the water behind them. The 28-foot-tall (8.5 m) 333,000-US-gallon (1,260,000 l; 277,000 imp gal) Kelp Forest exhibit was designed as the centerpiece of the aquarium, and was the first exhibit in the world to include a living kelp forest. In addition to the bay water provided to all tanks, a surge machine at the top of this exhibit provides the constant water motion that kelp requires. The top of the tank is open, and was situated to maximize its exposure to sunlight during the day, thus further mimicking the bay. Eighty species of seaweeds grow in this exhibit, some of which have also entered the aquarium through the water from the bay rather than being deliberately planted. The kelp in this exhibit grows about 4 inches (100 mm) per day, and requires divers to trim it once a week. Each of the main windows in this exhibit is 8 feet (2.4 m) wide, 16 feet (4.9 m) tall, and 7.5 inches (190 mm) thick. The largest tank in the Open Sea exhibit. The aquarium is known for housing an ocean sunfish and various great white sharks in this tank. In January 1996, the aquarium opened the Outer Bay wing to provide exhibits covering the open-water ecology of Monterey's Outer Bay. The main 1,200,000-U.S.-gallon (4,500,000 l; 1,000,000 imp gal) tank in this area is the largest in the aquarium, and features one of the world's largest single-pane windows. Crafted by a Japanese company, the acrylic window is actually five panes seamlessly glued together through a proprietary process. This area was extensively renovated starting in August 2010, and re-opened July 2, 2011, as the Open Sea galleries. Another exhibit created at this time includes a school of 3000 sardines (a fish that was once the foundation of Monterey's economy), swimming against the endless current of a toroidal tank. As part of the Open Sea renovation, the aquarium also added a puffin exhibit, juvenile sea turtle exhibit, and multimedia experiences highlighting microscopic plankton. Beginning in September 2004, the Outer Bay exhibit (now the Open Sea galleries) was the home to the first great white shark ever successfully kept on exhibit. The shark was at the aquarium for 198 days (the previous record was 16 days). The shark was released on March 31, 2005 after she bit two soupfin sharks in the exhibit, both of which later died. The aquarium staff believe the shark may have been acting to defend territory, as she did not eat the soupfin sharks. On the evening of August 31, 2006, the aquarium introduced another great white shark to the Outer Bay exhibit. The juvenile male was caught outside Santa Monica Bay on August 17 and was released on January 16, 2007. The shark had grown from an initial length of 5-foot-8 and 103 pounds when it arrived on August 31, 2006 to 6-foot-5 and 171 pounds on release. Data from this second white shark was transmitted back to aquarium staff from a pop-off satellite tag after 90 days. For the third time since 2004, the aquarium had a young great white shark in the Outer Bay exhibit in 2007/2008. He arrived on August 28, 2007 and was released on February 5, 2008. Like the first shark in 2004, he was caught accidentally in commercial fishing gear. Like the second shark in 2006, he was a young male: just 4-feet, 9-inches long and weighing 67 ½ pounds. As with the previous great white sharks, he was kept in an ocean holding pen off Malibu in Southern California until he could be observed feeding and navigating well in the confines of the pen. A fourth great white shark, a young female, was kept in August/September 2008; the fast release being due to its unwillingness to feed. From late August 2009, the young female was again featured in the Outer Bay exhibit and reportedly did well. She was successfully released to the wild in early November 2009, but died after being caught in early March in a gillnet set by a fisherman in waters off Ensenada, Mexico. The sixth individual was caught off of Malibu on August 18, 2011, and was placed in the Open Sea exhibit on August 31, 2011. It was released on November 1, 2011 off Point Conception and was reported dead soon after. In March 2000, the aquarium opened a penguin exhibit as part of its Splash Zone family galleries, to complement the already popular sea otter exhibit. Formerly, two penguin exhibits housed Magellanic penguins from South America and African Black-Footed Penguins. Today, the Black-Footed Penguin exhibit is the only penguin exhibit at the Monterey Bay Aquarium, with 18 individuals (nine breeding pairs) residing in the second floor enclosure. The aquarium also hosted 19 penguins from the Aquarium of the Americas in New Orleans along with two sea otters after that aquarium was badly damaged by Hurricane Katrina. Explore the wild coast of Baja California in Monterey Bay Aquarium’s newest special exhibition, “¡Viva Baja! Life on the Edge.” This 3.8 million dollar exhibit opened March 19, 2016 and includes colorful tropical fishes and invertebrates, plus the aquarium’s most diverse terrestrial exhibit, where—for the first time at the aquarium - you’ll encounter snakes, scorpions, tortoises, tarantulas and lizards that call Baja’s sun-scorched deserts home. Discover the extraordinary creatures living in lush mangrove forests that cling to the border of land and sea and teem in vibrant reefs. Learn how conservation groups on both sides of the border are working to ensure the future of this vibrant place and its animals, especially the vaquita–-the most endangered marine mammal in the world. Delight in interactive experiences such as “Rainbow Reefs” where visitors can decorate their own fish and send it to swim on a virtual coral reef. Enhance your experience with special auditorium program “Journey to Baja: A Tale of Three Travelers.” This program follows the migration of gray whales, brown pelicans, and elephant seals to the protected islands and beaches of Baja. In spring 2014, the aquarium opened "Tentacles: The Astounding Lives of Octopuses, Squid and Cuttlefishes." Over the life of the exhibit, visitors to Tentacles might see any of the two dozen species that will rotate through a dozen living exhibits, from giant Pacific octopus to Hawaiian bobtail squid, the Wunderpus and others – including one of the world’s smallest squid and one of the world’s largest cuttlefishes. From time to time there may also be displays of never-before-exhibited deep sea squid and octopuses collected in collaboration with the aquarium’s sister organization, the Monterey Bay Aquarium Research Institute. Tentacles includes multimedia interactive exhibits that dramatize the features that set these animals apart, and art pieces highlighting 4,000 years of human fascination: replicas of Minoan pottery and tiles from Pompeii and Herculaneum; Victorian-era scientific and literary illustrations; modern-day tentacle tattoos; and contemporary mechanical sculptures commissioned exclusively for the exhibition. Monterey Bay Aquarium staff conducts field research on great white sharks, sea otters and Pacific bluefin tuna to better understand these species – their migration patterns, population dynamics, food requirements and the threats they face in the wild. Years of data has led to insight into the lives of these animals. Aquarium staff are also involved in research on sevengill sharks, cookie cutter sharks and mobulid rays, as well as ocean sunfish and Humboldt squid, in addition to propagation efforts on several species of jellies, seahorses and cephalopods. The aquarium is also one of the main rehabilitation sites for shorebirds in Monterey County, including the western snowy plover. Since the plover recovery program began at the aquarium in 2000, aviculturists have banded and released 58 snowy plovers of all ages. The aquarium is also home to Seafood Watch, which publishes consumer guides for sustainable seafood purchasing. This program helps consumers and businesses choose seafood that's fished or farmed in ways that protect sea life and habitats. The recommendations indicate which seafood items are "Best Choices" or "Good Alternatives," and which ones to "Avoid." Seafood Watch raises public awareness about sustainable seafood issues through consumer guides, website, mobile apps and outreach efforts. Since 1999, over 56 million consumer guides have been distributed and the smartphone app has been downloaded over 1.5 million times. Changing the way we eat seafood, the program also encourage restaurants, distributors and seafood purveyors to purchase from sustainable sources. Seafood Watch currently has over 200 partners across North America, including two of the largest food service companies in the U.S. 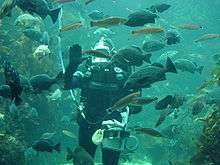 The Monterey Bay Aquarium maintains a close relationship with the Monterey Bay Aquarium Research Institute (MBARI), located in Moss Landing, California, at the head of the submarine Monterey Canyon. MBARI is renowned worldwide for its research on deep-sea marine life and other programs in marine biology. The aquarium also supports the Center for Ocean Solutions, a nonpartisan organization that brings together marine science and policy to develop solutions to the challenges facing the oceans. Monterey Bay is located within the Monterey Bay National Marine Sanctuary (MBNMS) a federally protected marine area (the equivalent of a saltwater national park) off California's central coast. They also have a license agreement with Safari Ltd, who produces the Monterey Bay Aquarium collection. The collection features sea life animal figurines that are scientifically accurate and to scale. The Monterey Bay Aquarium was endowed initially with a personal gift from David and Lucile Packard, with the vision that the aquarium would be self-supporting after it opened. Initial construction cost was US$55 million. The David and Lucile Packard Foundation, other foundations and individuals support some programs of the aquarium. Operating costs are largely covered by visitor admission, as well as by special events and membership dues. No government money is involved, with the exception of an occasional federal grant given to visiting scientists, for study. The MBA has more than 400 employees and over 1000 volunteers. The Aquarium appeared as the Cetacean Institute in Sausalito in the 1986 film Star Trek IV: The Voyage Home. The main aquarium was overlaid with special effects to appear to be the tank home of two humpback whales. It was also the inspiration for the Marine Life Institute in Pixar's Finding Dory. Schooling fish in the Outer Bay exhibit. Sea Otter exhibit is one of the favorites at the Aquarium. A section of the aviary at the aquarium. A sanderling (Calidris alba) standing on one leg at the aviary. Blackfooted penguins in the Splash Zone. 1 2 "Aquarium Facts & History". montereybayaquarium.org. Monterey Bay Aquarium. April 1986. Retrieved 8 April 2012. 1 2 "Basic Press Kit". montereybayaquarium.org. Monterey Bay Aquarium. 2005. Retrieved 8 April 2012. ↑ Abel, David (2016-08-02). "Top aquariums in the US, in terms of visitors". Boston Globe. Retrieved 2016-12-02. ↑ "List of Accredited Zoos and Aquariums". aza.org. AZA. Retrieved 31 Jan 2012. ↑ "Early Years". Monterey Bay Aquarium Foundation. Retrieved 6 July 2013. ↑ "Explore Our History: 1980–1983". montereybayaquarium.org. Monterey Bay Aquarium. Retrieved 8 April 2012. ↑ "Explore Our History: 1977". montereybayaquarium.org. Monterey Bay Aquarium. Retrieved 8 April 2012. ↑ Watanabe, JM; Phillips, RE (1985). "Establishing a captive kelp forest: Developments during the first year at the Monterey Bay Aquarium". In: Mitchell, CT (ed). Diving for Science…1985. Proceedings of the Joint American Academy of Underwater Sciences and Confédération Mondiale des Activités Subaquatiques annual scientific diving symposium 31 October - 3 November 1985 La Jolla, California, USA. Retrieved 2013-10-27. ↑ "Kelp Forest". montereybayaquarium.org. Monterey Bay Aquarium. Retrieved 8 April 2012. 1 2 "Kelp Facts". montereybayaquarium.org. Monterey Bay Aquarium. Archived from the original on 31 January 2013. 1 2 Monterey Bay Aquarium. White Sharks on Exhibit. ↑ "About MBARI". mbari.org. Monterey Bay Aquarium Research Institute. August 26, 2008. Retrieved 2009-01-02. ↑ "Nature Inspired Toys - About Safari Ltd®". www.safariltd.com. Retrieved 2016-03-07. ↑ "An Inside Look at Monterey Bay Aquarium". Salmon Facts. December 18, 2008. Retrieved 2009-01-02. ↑ "A Touch of Hollywood". montereybayaquarium.org. Monterey Bay Aquarium. April 1986. Retrieved 8 April 2012. ↑ Brayson, Johnny (June 16, 2016). "Is The Marine Life Institute Real? You'll Want To Visit 'Finding Dory's Jewel Of Monterey". Bustle. Retrieved July 16, 2016. Wikimedia Commons has media related to Monterey Bay Aquarium.